Latest Version, Professional Edition. Priced per station - call for quantity purchases. To be used for single or multiple lanes in one physical location (single store operation). If Barcode printing is required you must purchase BCE license module. Latest Version, Enterprise Edition. Priced per station - call for quantity purchases. To be used for businesses with multiple physical locations (multi-store operation). Barcode printing BCE license module is included. Professional Edition 10 License Pack. Latest Version, Lite Edition. Priced per station - call for quantity purchases. To be used for single or multiple lanes in one physical location (single store operation). 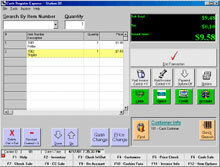 If barcode printing is required you must purchase BCE license module.